You can subscribe to our blog using our RSS feed. Author Robin Asbell will conduct a book signing at the Seward Co-op on Thursday, January 26 from 4 to 6 pm. 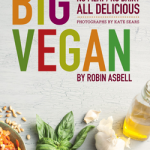 Big Vegan includes 350 recipes covering every meal and focusing on natural foods. Cookbooks are available for purchase with a personalized autograph by author, Robin Asbell, with every book sold. Sample a recipe from the book at the event, too. 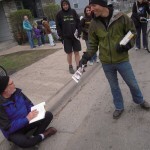 Join Robin Asbell at the Seward Co-op, 2823 East Franklin Avenue Minneapolis, MN 55406. Please take your last chance before the year ends to make a generous donation to Compassionate Action for Animals. Your financial support will enable us to reach thousands with the message of compassion. What will your New Year's resolution be? Ours is the same as always. We will do everything we can to help animals. When we contemplate the future, we see a world where factory farms no longer exist; animals are treated with kindness, compassion, and respect, rather than as tools or machines. But we can't reach this future without your help. Please consider signing up for a recurring donation. If just a small fraction of the people on this list signed up to give a mere $10 per month, we could give out free vegan samples to tens of thousands of people! If you can't give on a recurring basis, please consider a one time gift of $50 or $25 today. Make a resolution to reduce suffering in 2012, and help make a difference! Make a gift to help animals! Please consider making a gift in 2011 to Compassionate Action for Animals. Your support will enable us to develop and implement effective methods to get the word out about the horrors of animal agriculture and plant-based alternatives. But we need your help to make it happen. Please make a donation today to help animals! Our Hen House, a premier media source for animal activism, interviews Compassionate Action for Animals' Executive Director, Unny Nambudiripad, about food activism. In the first of the two part series, Unny talks about the ins and outs of food giveaways. Drawing on CAA's long and extensive efforts to feed vegan food and get the word out about plant-based options, Unny talks about how to conduct them and why they're effective. In the second part, Unny talks about CAA's successes reaching out to restaurants, food service providers, and cooking classes. These interviews were conducted by Our Hen House, an excellent resource for animal activists. Its blog and podcast have helpful tips and resources to empower every animal activist. Our first ever Twin Cities Veg Fest is making progress! We've found some sponsors and speakers, and we've got a website with great resources. We're hosting a day-long celebration of all things veg on July 14, 2012 in Coffman Memorial Union. We're looking forward to great food, speakers, and fun! This will be a great opportunity to learn more about animal ethics and vegan eating, and share time with like-minded folks. Mark your calendar for July 14. Check out our website and our nice new logo. Let us know if you're interested in sponsoring, or know of somebody who would like to sponsor us. Follow us on Facebook or Twitter and refer us to your friends! Check back later for a list of sponsors, exhibitors, and speakers. We're also going to want your help to advertise the event! Are you vegan living on a budget? Whether you're vegan, vegetarian, or just flirting with the idea of trying a plant-based diet, Eat Vegan on $4 a Day by Ellen Jaffe Jones will help penny-pinching veggie enthusiasts try new recipes without breaking the bank. Eating on $4 a day may be laughable, but once you dive into this vegan cookbook, you'll realize how reasonable and sensible this minimal chunk of change can be. Before getting into the money-saving recipes, her introduction covers a wide array of cost-effective techniques and ethical positions around veganism. She gives several helpful tips to cut grocery store costs, some obvious like buying store brand items (even store brand organic! ), some insightful like only bringing cash (which causes you to limit your purchase to necessities), and some time-consuming like tracking and comparing prices from different stores. However, if you are pressed for time, she has a few helpful tips to condense time-consuming food preparation and price-comparison shopping, explaining the benefits of cooking from scratch and comparing prices. Jones further explains the damaging health effects of hormones, pesticides and mercury found in many animals and why plant-based diets can save on health care costs, preventing many diseases associated with chemicals found in meat, dairy, eggs, and fish. She states that, "paying for illness is expensive whether the money comes out of your pocket or the government's." She clarifies the complexities behind health research, advertising and policy dollars, marketing and why agencies are not promoting a healthy, plant-based diet when it can solve many of the health problems facing our society today. Additional health benefits can also be achieved buying organic, local produce. Jones advocates for seasonal food, which can be the cheapest and freshest. Try a local farmer's market, CSA, or Co-op! Can't afford to buy entirely organic produce? Then just make sure to avoid the "Dirty Dozen" most pesticide and chemically covered food, which Jones identifies. By spending a bit more on these twelve organic items, you'll drastically decrease the amount of chemicals ingested and save money in the long run on medical bills. If you're looking for helpful information on nutrition and how to eat healthy as a vegan, Jones has a great section explaining what different types of food we need and how much of each. She even goes further to explain how to cook these different foods from scratch (ratio of water to legumes/grains and length of cooking time). Struggling to stay on track or make the switch to vegetarianism or veganism? Jones also has some basic advice on how to overcome temptations left by roommates or family members who buy and eat foods that are not included in a vegan diet. After this lengthy, but helpful, introduction, Jones dishes out recipes (sans pictures) for almost any occasion, noting the price per serving of each meal, which is helpful for the near future, but may become inaccurate as inflation occurs and produce prices increase. Many of these dishes are inexpensive, but some, like certain $3 salad servings, are costly and would be difficult to include in any "$4 a day" budget. For some recipes (but not all), she also lists expiration dates, and unfortunately, some salad dressings only last 4 days. In other words, be aware of price fluctuation and inconsistencies when perusing Eat Vegan on $4 a Day! If you're not sure where to start, try her menu plan – 7 days of meals all costing under $4 a day ($28 for the entire week)! Everyone who wants to make the world a better place faces the same challenge: opening people's hearts and minds to new ideas. Those who are successful in making the world a better place are students of human nature. They understand that each of us is born with a certain intrinsic nature, raised to follow specific beliefs, and taught to hold particular prejudices. Over time, we discover new "truths" and abandon others, altering our attitudes, principles, and values. Even though we can recognize that our belief system changes over time, at any given point, most of us believe our current opinions are "right" – our convictions well founded, our actions justified. We each want to think we are, at heart, a good person. Even when, years later, we find ourselves reflecting on previously held beliefs with a sense of bemusement (or worse), it rarely occurs to us that we may someday feel the same way toward the attitudes we now hold. For those of us who have the privilege of meeting thousands of students a year, nothing delights us more than to have an attentive class ready to share and eager to learn. As Compassionate Action for Animals' humane education program Bridges of Respect finishes up its 12th year of presentations in middle, high schools, and colleges around the Twin Cities, we reflect on how today's youth are ready to work at making a difference. We've seen a growing number of discussions around global food issues in classes like Family & Consumer Science, Health, and Home Economics. Bridges of Respect is getting more and more requests for our Ethics & Environment presentation, where we have the opportunity to compare and contrast veganism with animal agriculture. From antibiotic resistant germs, waste runoff, and algae blooms to topsoil erosion, pandemics like bird flu, and rampant animal cruelty, the food industry is in need of what the president of the International Institute for Humane Education calls conscientious change-makers. During our food-related presentations this year, we were excited to expand our vegan food sample offerings. 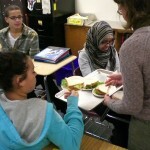 CAA volunteers prepared Tofurky sandwiches with Vegenaise and lettuce, along with soy milk, for 140 students at Como High School in St Paul. They were a hit! We had one positive evaluation after another about the sandwiches. One student was a little surprised remarking, "I can't believe this isn't meat" and simply "it's good." Throughout 2011 we provided nearly every presentation topic we offer at 10 different local high schools and colleges. Students at New Beginnings High School in Chaska listened to our Beyond Violence presentation, where we discussed how our treatment of animals can desensitize us to violence, or can lead us to a more compassionate community. Our long-time humane educator Christine Coughlin shared our Animals in Entertainment presentation with students at Edina High School. Christine is also president of Minnesota Voters for Animal Protection and is able to bring her real world experience of working on animal protection with policy makers and the media into the classroom. "It is uncertain whether 21st century students are so inundated with tales of extinction, erosion, and overturned tipping points that they have become overburdened and demoralized. It is certain, however, that these students need to learn that our pressing problems offer exciting and viable solutions." As students begin analyzing their choices and making public contributions based on their convictions, the value of humane education is increasingly recognized by society at large. Humane education is now a public school mandate in 13 states. As it grows, Bridges of Respect will be there to meet the need. University of Minnesota to Start Meatless Mondays! We worked hard this semester to encourage the University of Minnesota to incorporate more vegetarian and vegan options in their residential hall food service, and we won! Starting in the spring semester of 2012, Pioneer Hall will offer an all-vegetarian lunch on Mondays. Compassionate Action for Animals collected 300 petition signatures asking to implement an all-vegetarian meal once per week. We then met with University Dining Services (UDS) and presented the petitions — they agreed! See Fox9's article about Meatless Monday. We're pleased that UDS has taken this bold step. It will help thousands of animals that will not be exploited and killed for food, and it will also raise awareness about vegetarian dining options. If you are a University student and have a meal plan, eat lunch on Monday at Pioneers and try their vegetarian meal! Please give UDS positive feedback so that they will continue to offer Meatless Monday. We know that critics will be contacting UDS, so UDS needs to hear from you, too! You can call them at 612-626-7626, email them at dining@umn.edu, or thank them on their Facebook page. If you are not a student, you can contact your favorite restaurant, your company's food service provider, or your school's dining services and ask them to participate in Meatless Monday. Thanks to UDS for making this happen! We will be working next semester to let students know about this new option.